Get your meat out of the fridge and up to room temperature before you cook it. Preheat the oven to 180oC/350oF/gas 4. Peel the onion, cut into wedges and place in a roasting tray with the giblets and a splash of water. 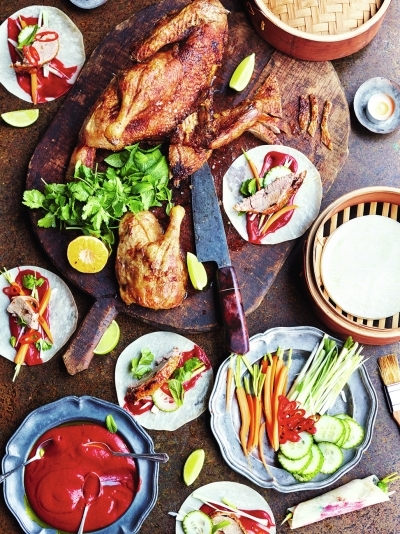 Rub the duck all over with 1 tablespoon of oil, 1 tablespoon of Chinese five-spice and a really good pinch of sea salt. Halve the clementine and place in the cavity, then sit the duck directly on the bars of the oven, with the tray of onions and giblets underneath to catch the tasty fat. Roast for 2 hours, or until the duck is crispy and cooked through, turning the onions occasionally to prevent them from catching. While the duck cooks, prep the garnishes. Trim and halve the spring onions and carrots, then finely slice lengthways, scratch a fork down the cucumber, and finely slice it with the chilli. Pick the herb leaves. Cut the lime into wedges. Remove the cooked duck to a platter, cover, and rest for 30 minutes. Pour all the fat from the tray into a jar, cool, and place in the fridge for tasty cooking another day. Now you’ve got a choice: you can make a dark hoisin utilizing the bonus flavour from the tray, or you can do it separately in a pan to achieve the vibrant colour you see in the picture – both ways are super-tasty, it’s purely personal preference. Using the tray, remove and discard the giblets, leaving the onions behind. Place over a medium heat on the hob, peel, roughly chop and add the garlic and ginger, add 1 teaspoon of five-spice, then stir in the cranberries, picking up all the sticky goodness from the base of the tray. Cook for 2 minutes, then add the soy, rice wine vinegar, honey, clementine juice and a splash of water. Simmer for 5 minutes, or until thick and glossy. Pour into a blender and blitz until smooth, then taste and season to perfection. If you’re doing it in a pan, just follow the instructions above, adding a splash of oil to the pan before the garlic, ginger and five-spice. In batches, warm the pancakes in a bamboo steamer over a pan of simmering water for just 1 to 2 minutes. Slice the duck meat, or get two forks and ravage it all off the bone. Serve everything in the middle of the table so everyone builds their own. The crispy duck skin will be an absolute treat dotted on top!